The London Marathon is one of the greatest sporting and charitable city-centre marathons in the world. WomenAid is delighted that it is once again fielding a team of committed runners – the WOMENAID STARS. By participating in this world-class marathon the runners have accepted a very real physical and psychological challenge! However the self-discipline to maintain a rigorous training schedule through several winter months is not the only evidence of a great commitment. The WOMENAID STARS have also dedicated themselves to help others in need by collecting donations from friends, family, colleagues, and other sponsors in support of WomenAid International programmes. WomenAid is deeply appreciates the support of our London Marathon runners, the WomenAid Stars. We salute each of our runners and wish them all a great personal victory. To make a donation in support of a member of the WOMENAID STARS please visit the personal pages below. TAKE UP THE CHALLENGE - RUN THE LONDON MARATHON! The annual Flora London Marathon is now recognised as the greatest city-centre marathon in the world, not only by the runners and media, but by the organisers of the other leading marathons worldwide. It boasts the largest number of entrants. It also has a very strong elite field, lining up current and past Olympic and world champions alongside world record holders. But at the heart of the day can be found the 30,000 plus amateur, club and fun runners who make the London Marathon such a unique and memorable occasion. Each year thousands of participants run to raise money for their favoured charities, many wearing weird, wonderful and often cumbersome fancy-dress outfits. An estimated £150 million has been raised for charity since the first London Marathon was held in 1981. 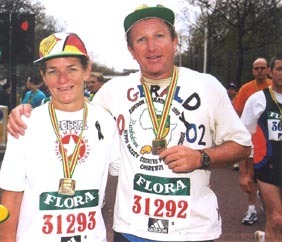 With Marathon places provided by WomenAid International, Gerald Pallister, headmaster of the Hippo Valley Estates Primary School and his wife Debbie, participated in the Flora London Marathon 2002 to raise funds for the Chiredzi Christian Children’s Home. The orphanage in Tshovani, Chiredzi was set up by the Church of Christ’s Central Africa Mission to look after the Aids orphans. “It is very demanding. You get tired, very tired and yes it hurts, but all that fades as you cross the finishing line knowing that you have tried and succeeded and in the process been able to make a positive difference to someone else’s life." "The London Marathon serves as an inspiration to us all and is the ultimate personal challenge!" Take up the Challenge - Run the 2004 London Marathon!